The demand for efficient water management has increased. Studies show that landscaping receives more water than it actually needs to remain healthy. As a result, you can actually lower your water bill by installing an efficient water system. Conserving water may save you hundred or even thousands of dollars every year on your water bill, depending on the size of the area that requires regular watering. In addition, you will also decrease the environmental footprint of your home or business by using less water. 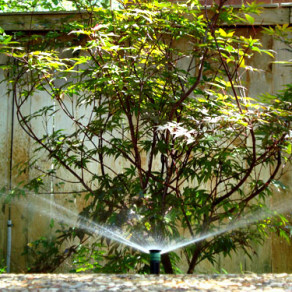 H3O Water Systems can help you to set up your irrigation schedules for effective water conservation. We install, upgrade, and maintain sprinkler and irrigation systems. Before you invest in a sprinkler system for your property, you should consider the types of plants you have, the soil and root depth of the plants. These factors will determine how much water is needed to keep your plants healthy. H3O Water Systems has in-depth knowledge of irrigation systems can can install a new irrigation system or retro-fit drip irrigation into your current sprinkler system. Once we install this system you can expect that your water costs will decrease as you use water more efficiently. A well-designed drip irrigation system provides the benefits of delivering water directly to the roots of your plants in order to minimize waste. In addition, you no longer have to worry about your plants dying during the months where drought restrictions are in place. Our expert irrigation technicians in New Braunfels will install a drip irrigation system that meets the specific needs of your property. These irrigation systems are being installed in homes and businesses throughout New Braunfels and other areas of the greater San Antonio area. We can perform a free consultation to find out about your landscaping and hardscaping in order to design a system that will provide the best possible results. H3O Water Systems has over 100 years of combined experience in water systems. Since 2006, we have served our customers with only the highest work ethic and quality services. At H3O, we offer a full range of commercial and residential services, including irrigation systems in New Braunfels installation, repair and maintenance. At H3O Water Systems, total customer satisfaction is our goal. From the design to installation and maintenance of your system, we can help to ensure that your entire experience is a positive one. Request an estimate or give us a call at (210) 404-9939 for immediate assistance.